It’s beginning to look a lot like Christmas—on your nails. Independent nail artist Akiko Nemoto uses a steady hand and collection of decals like crystals, glitter, studs and imported stickers from Japan to achieve stunning hand-painted designs. She offers holiday color combo ombré nail art ($15) as well as snowflakes, Christmas ornaments and even message nail art ($5–$8 per nail). Diverting from classic Christmas designs, freelance nail artist AstroWifey (a.k.a. Ashley Crowe) has whipped up a sparkly array of sophisticated shellac no-chip nail art with jewels, Swarovski crystals, foils and glitter. Shellac manicures are gentle on natural nails and have a two-week shelf life to last through the holidays. Manicures start at a base price of $35 and designs start at $3 per nail. All that glitters is gold—and silver—at Naughty Nail’z with silver and gold MINX mani-pedis on sale for $75 until New Year’s Day. Because Naughty Nail’z specializes in freehand art, virtually any holiday style (hello, Hanukkah!) is game. 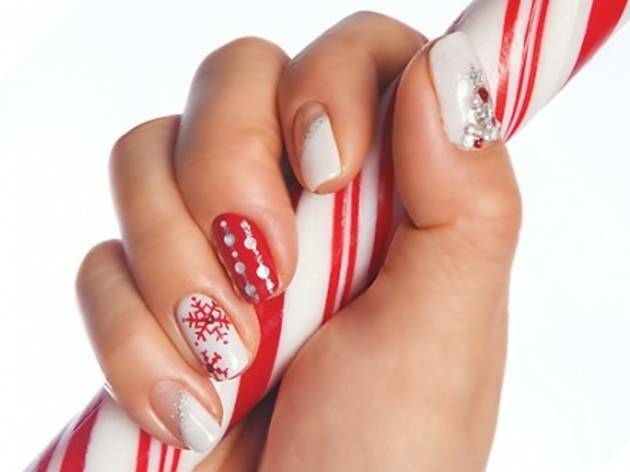 Nail technicians can transform nails into anything from snowmen and striped candy canes to full Christmas trees. Manicures are a steal at $15 for a basic manicure and $35 for no-chip services, with holiday designs for $1 per nail.